Susan Laskin, #1 Agent 9 Consecutive Years! “Ed White, branch vice president of the Pascack Valley Regional Sale Office of Coldwell Banker Residential Brokerage located at 50 Broadway in Hillsdale, has announced that River Vale resident Susan Laskin, a 25-plus-year veteran real estate sales associate, has just completed her ninth consecutive year as the top agent in her office. Laskin has held this high honor every single year from 2005 through 2013.” Read the full article at NorthJersey.com. Call Susan Laskin Today To Make Your Next Move A Successful One! 201-615-5353. SusanLaskinRealtor.com. Emerson NJ Real Estate – December 2012 Market Report! Emerson, New Jersey (located in the sought after Pascack Valley region of Bergen County) saw the sale of 12 homes during December of 2012. The average List Price was $506,725. The average Sold Price was $465,583. The median Sold Price was $423,500. On average, homes that sold in Emerson during Dec 2012 sold for 91.88% of the List Price. In addition, there were 9 Emerson homes on the market at the end of Dec 2012. Their average List Price was $485,053. Read more Pascack Valley Real Estate Market Reports! 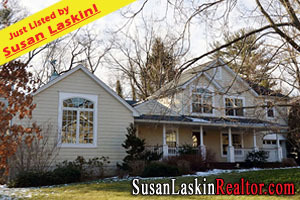 Woodcliff Lake NJ Real Estate – December 2012 Market Report! River Vale NJ Real Estate – December 2012 Market Report! Hillsdale NJ Real Estate – December 2012 Market Report! River Vale Real Estate - Sophisticated Custom Home! Sophisticated & Expanded Custom Home w/ a remarkable Great Room, a wonderful Master Suite and soaring ceilings in the Beamed Kitchen! 607 Thurnau Dr in River Vale ($698,950!) boasts a columned covered front porch that leads to the leaded front door, an exquisite Great Room addition w/ remarkable details & an outstanding and spacious rear yard! Take a Virtual Tour of this home! Click here for more photos & information! Looking for more River Vale Real Estate? Browse through my Feature Homes! Some incredible listings across the wonderful Bergen County towns! Susan Laskin Achieves Company Honor! As reported by NorthJersey.com, Susan Laskin has once again received Coldwell Banker's highest honor in being named as a member of the Coldwell Banker President's Council! Read the entire article on NorthJersey.com! Thinking of Buying or Selling your Bergen County home? Call Susan Laskin... and then start packing! Top 1% of Coldwell Banker Agents Internationally! For more information, call Susan at 201-615-5353 or visit SusanLaskinRealtor.com.